Well it is a little different as the change was not little in this case. 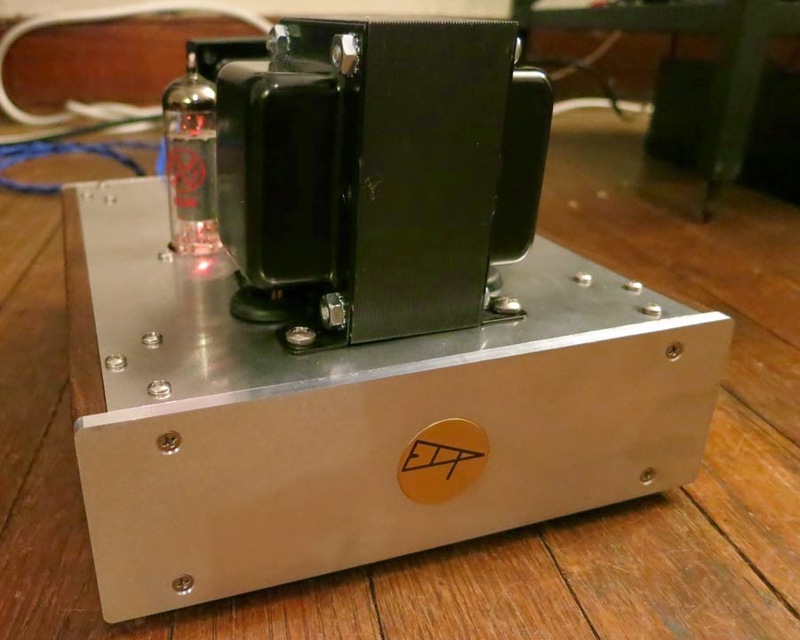 About a year and a half ago I received a request from a friend to build him a custom tube power amplifier. As a general rule, I don't like to build custom one-offs for people. It always takes a lot more time than it seems like it will, things always go wrong, and for the cost, there is usually something commercially available that will scratch the particular itch that the person might have. This is not to say that one-offs do not have their place, but in general if someone thinks he needs something so exotic that nobody else makes it, he is probably a tinkerer, and he should build it for himself. In this case, however, I had recently built something similar to what he wanted for the console project, and I thought it could be adapted for his needs, and more importantly, I owed him a big favor. So we decided on what should have been a routine project. It was going to be a run of the mill 12AT7 Long Tailed Pair to EL84 push-pull output stage. I won’t bore you with the details other than to say that pretty much everything that could go wrong with the project, did. In the end, the amp was noisy as all get out ultimately caused by an irredeemably poorly made PCB. After an amazing amount of frustration, I decided to just build something else. My most recent project had been the Black Diamond amplifier, and this seemed like a good starting point. The novel thing about that circuit is that instead of using transistors or tubes for gain, it uses a step up transformer. 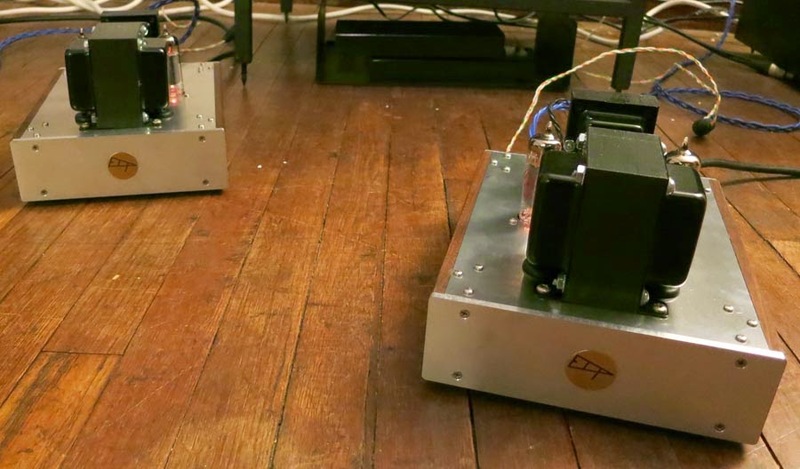 And, in order to get the transformer to work well as a voltage amplification device, it is driven by a low output impedance diamond buffer that uses a servo to eliminate any DC offset on the output. This topology had a couple of things to recommend it here. The most obvious was that since I still wanted this to be a push-pull EL84 amplifier, I was going to need a phase splitter. Conveniently enough, this is another of the primary uses for transformers in audio circuits. And it worked especially well here since the friend for whom the amp was being built wanted something that used RCA (single ended) inputs. Additionally, one of the issues with transformers for gain is that the output impedance increases by the square of the step up ratio. So, for instance, if the transformer has a stepup ratio of 1 to 5, meaning that a 1 volt signal on the input equates to a 5 volt signal on the output, the output impedance will be 25 times the input impedance. Depending upon what one is trying to drive this way, this can be a severe limitation. For instance, a 6922 cathode follower has an output impedance of about 100 Ohms (calculated by ~1/gm.) Using the 1 to 10 step up, this would result in a 10000 Ohm output impedance. Not terrible, but not good either. And trying to get as much gain from the stepup as the 6922 can provide itself (~30x) would result in a 90,000 Ohm Z out as opposed to the 2500 Ohm rp of the tube. Obviously not a good tradeoff. This places real practical limits on the gain and driving ability of such a circuit. So why use a transformer at all? Well, the best answers are linearity, noise, and perhaps simplicity. Transformers impart essentially no noise into a circuit, which cannot be said of tubes or transistors. There is simply no hiss associate with them. Moreover, while all components impart some distortion, the distortion from transformers is very low, and seems to be of the sort that our ears do not mind. So yes, a transistor gain stage wrapped in feedback may measure lower for THD, but in terms of delicacy and transparency, it will never come close in subjective performance to a quality transformer. And finally, a transformer is easier to implement – there are few associated components, no plate loads, no DC blocking capacitors, no heater supply, etc. And back to the driving ability, in this case, the diamond buffer has a very low output impedance (about 10 ohms here) and EL84’s are very easy to drive both in terms of necessary voltage, and in terms of input impedance and Miller capacitance. Thus the limitations of the transformer as gain device were not limitations at all. Indeed, the amount of gain from a transformer is actually about perfect, while just about any practical tube one might use here will have a little too much gain forcing one to throw away signal on the preamp. This is bad because gain is expensive in terms of distortion and noise, so adding gain just to throw it away somewhere tends to lead to poorer sound quality. So that was the theory of the project. The practical build also offered some interesting options. As I say, I wanted to maintain the EL84 output stage which was largely due to an investment in tubes and output transformers on my part. And, Hammond makes a very cheap power transformer with just the voltage and power for a pair of EL84’s and their heaters, and I happened to have a couple of those. And I had a pair of Electra-Print stepups I had picked up used at some point. Additionally, I have been playing with high quality switching power supplies lately. I know. I know. Switchers have no place in audio. But actually, they can be great. First, these are not the $4 wall warts that come with your router. They are high-quality, well-built, low-noise power supplies. They run at a very high frequency that is both well outside the audio band, and that is very easy to filter. And, it turns out linear supplies are not really as quiet as people think. The switching noise from even the quietest diodes can impart tremendous noise into a circuit, and because the switching is at a considerably lower frequency than from the switcher, it is way more work to filter. 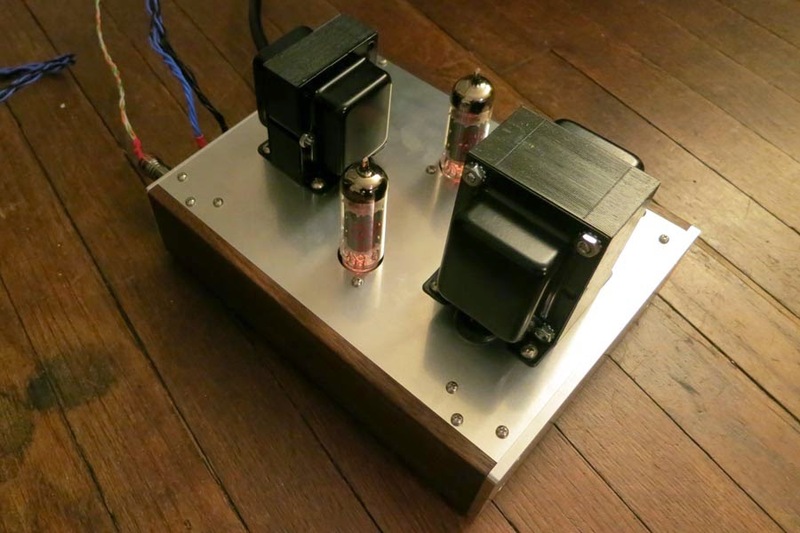 For this amp, I used a +/-12V switching supply that was small and PCB mountable to power the buffer. It also added a nice side benefit that the -12V rail, with a couple resistors to form a voltage divider, made a fantastic bias supply for the tube output stage. It is fantastic because it allows the tubes to run fixed bias, any noise would be cancelled due to the differential output stage, but this was a non-issue as, as mentioned, the supply is really quiet anyway. And this led to super quiet awesome sounding little tube amps. I had some left over wood sides from DSHA-1 and L-2 builds, and I used those for the case. Awesome amp from an awesome guy! Thanks for sticking it out with this difficult project. The end result was totally worth it. I am extremely fortunate to have been the beneficiary of this! I don't know if there's a market for such a speaker amp, but all I can say is that it sounds great. Better than my old classic Krell KSA-100 (or maybe it's more accurate to say it's a better match for my Meadowlark Shearwater Hotrods). Thanks, Doug! Oops, looks like my google account uses my wife's name - that post came from John Lim. My wife will be thrilled.